Fullname: Lourdes Yunielki Gurriel Jr.
Lourdes Yunielki Gurriel Castillo Jr ... Played for Sancti Spíritus and the Industriales of the Cuban National Series before defecting ... In February of 2016, Lourdes and his brother, Yulieski, defected after competing in the Caribbean Series in the Dominican Republic ... Ranked as one of the top international prospects available following his defection ... His eldest brother, Yunieski, played almost two decades in Cuba's Serie Nacional and also starred for Quebec in the Canadian-American Association ... Their father, Lourdes Gurriel Sr., played for the national team for 15 years and won a gold medal, two batting titles and a Most Valuable Player Award in Cuba... He was also a national team manager ... The brothers also had an uncle, great uncle and cousin who shined on the diamond in Cuba ... Ranked as the Blue Jays' 5th-best prospect by Baseball America entering 2018. Among AL rookies (min. 200 PA), ranked 4th in AVG (.281), 7th in SLG (.446) and 8th in OPS (.755) ... His 70 hits tied for 4th most all-time by a Toronto batter through his first 65 career games ... Had an 11-game multi-hit streak from July 11-29, surpassing Tony Fernandez (9G in 1986) for the longest in franchise history... Was the longest by a rookie all-time and tied for the longest in AL history with Shoeless Joe Jackson (1912) and Sam Rice (1925)...Became the 7th player since 1900 to record an 11+ game multi-hit streak (last: Tony Perez - 11 in 1973) ... Had hits in each of his 18 starts from June 21-Aug. 18, tied for the 4th longest streak in the Majors... Hit .423 (33-for-78) with 4-2B, 5-HR and 16-RBI over that span ... Had a career-long 12-game hitting streak from July 11-Aug. 24 (.481, 26-for-54, 3-2B, 3-HR, 10-RBI), one game shy of Justin Smoak for the longest by a Blue Jay in 2018 ... Reached base in 15 straight games from July 11-Aug. 28 (.415/.449/.600) ... Hit .423 (30-for-71) over the course of July for the highest batting average in the AL... Was named AL rookie of the month, the 7th player in team history to claim the honour (last: Devon Travis - April, 2015) ... Was on the DL with a concussion from July 15-21 and landed there again from July 30-Aug. 23 with a left ankle sprain ... Reached base safely in 37 of his last 44 starts (.311/.343/.482) ... Called up from Double-A New Hampshire on April 20... Recalled from Triple-A Buffalo on June 19 and July 2... Went 17-for-49 (.347) for the Fisher Cats (5-XBH, 11-RBI) and hit .281 (38-for-135) over 34 games for the Bisons, with 8-2B, 5-HR and 28-RBI ... In his MLB debut on April 21 at NYY, drove in two runs with a 4th-inning single and added a 3rd RBI with a single in his next at-bat...Became the 4th Blue Jay all-time with a 2+ hit and 3+ RBI MLB debut (Pat Borders, Eric Hinske, J.P. Arencibia) ... Hit his 1st career home run, a solo shot off Bartolo Colon, to start the 7th inning on April 28 vs. TEX ... In Game 1 of a doubleheader on May 3 at CLE, hit his 1st career double... Went 3-for-5 for his 1st career three-hit effort... Put the Jays ahead, 8-7, with a single in the 7th ... Notched his 3rd career HR and went 2-for-4 for his 4th career multi-hit effort (21st game) on June 21 at LAA ... Recorded 13 RBI in his first 24 MLB games, becoming one of 10 Blue Jays all-time with 13+ RBI through their first 24 career games ... On July 23 vs. MIN, became the 13th player in team history to record 5+ HR in his first 33 MLB games (12th player with 16+ RBI) ... Followed up a Curtis Granderson leadoff homer with a home run of his own on July 27 at CWS, starting a game with back-to-back home runs for the 4th time in franchise history... Added another blast for his 1st career multi-HR game... Added a double for his 3rd three-hit game and his 1st career 3-XBH game ... Tied the game, 8-8, in the 9th inning with his 9th home run on Sept. 20 vs. TB... Was his 1st game-tying HR and his 1st 9th-inning homer ... On Sept. 21 vs. TB, homered twice for his 2nd career multi-HR game... Became the 14th player in team history to homer in three straight plate appearances and the 1st Blue Jays rookie to do so... Along with his brother, Yuli (HOU), became the 1st set of brothers in MLB history with multi-HR games on the same day. Assigned to the Advanced-A Dunedin Blue Jays to start the season ... Spent time on the disabled list from April 6-18 (thumb and hamstring) ... Re-injured his leg in his minor league debut on April 19 (1-for-2, 2B, RBI) and returned to the DL from April 20-June 18 ... Promoted to Double-A New Hampshire on July 12 after 18 games with Dunedin (.197 AVG, 1-2B, 1-HR, 8-RBI) ... Slashed .241/.286/.371 over 46 games for the Fisher Cats, including 10-2B, 4-HR and 28-RBI with 10BB/30K and 2-SB ... Started 17 games at shortstop and 21 games at second base for New Hampshire ... Played for the Peoria Javelinas in the Arizona Fall League after the season where he hit .291 (23-for-79) in 21 games (7-2B, 3-HR, 11-RBI). In August declared a free agent by Major League Baseball...Ranked as the sixth best international prospect available at that point...In September, he held a showcase of his skills at Rod Carew Stadium that was attended by 60 MLB scouts.... On November 12, signed a seven-year, Major League contract with the Toronto Blue Jays. 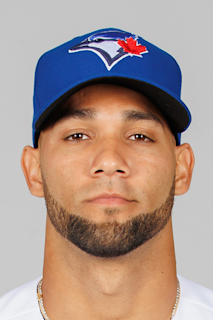 April 15, 2019 Toronto Blue Jays optioned 2B Lourdes Gurriel Jr. to Buffalo Bisons. August 24, 2018 Toronto Blue Jays activated 2B Lourdes Gurriel Jr. from the 10-day injured list. August 21, 2018 Toronto Blue Jays sent 2B Lourdes Gurriel Jr. on a rehab assignment to Buffalo Bisons. August 18, 2018 Toronto Blue Jays sent 2B Lourdes Gurriel Jr. on a rehab assignment to New Hampshire Fisher Cats. August 1, 2018 Toronto Blue Jays placed 2B Lourdes Gurriel Jr. on the 10-day disabled list retroactive to July 31, 2018. Left ankle sprain. July 22, 2018 Toronto Blue Jays activated 2B Lourdes Gurriel Jr. from the 7-day disabled list. July 15, 2018 Toronto Blue Jays placed 2B Lourdes Gurriel Jr. on the 7-day disabled list. Concussion. July 2, 2018 Toronto Blue Jays recalled 2B Lourdes Gurriel Jr. from Buffalo Bisons. July 2, 2018 Toronto Blue Jays activated 2B Lourdes Gurriel Jr..
June 22, 2018 Toronto Blue Jays optioned 2B Lourdes Gurriel Jr. to Buffalo Bisons. June 19, 2018 Toronto Blue Jays recalled Lourdes Gurriel Jr. from Buffalo Bisons. May 13, 2018 Toronto Blue Jays optioned 2B Lourdes Gurriel Jr. to Buffalo Bisons. April 20, 2018 Toronto Blue Jays recalled Lourdes Gurriel Jr. from New Hampshire Fisher Cats. April 3, 2018 2B Lourdes Gurriel Jr. assigned to New Hampshire Fisher Cats. March 15, 2018 Toronto Blue Jays optioned 2B Lourdes Gurriel Jr. to Buffalo Bisons. October 2, 2017 Toronto Blue Jays recalled Lourdes Gurriel Jr. from New Hampshire Fisher Cats. July 12, 2017 2B Lourdes Gurriel assigned to New Hampshire Fisher Cats from Dunedin Blue Jays. June 19, 2017 Dunedin Blue Jays activated SS Lourdes Gurriel from the 7-day disabled list. April 20, 2017 Dunedin Blue Jays placed SS Lourdes Gurriel on the 7-day disabled list. April 19, 2017 Dunedin Blue Jays activated SS Lourdes Gurriel from the 7-day disabled list. April 6, 2017 Dunedin Blue Jays placed SS Lourdes Gurriel on the 7-day disabled list. March 17, 2017 Toronto Blue Jays optioned OF Lourdes Gurriel to Dunedin Blue Jays. November 12, 2016 Toronto Blue Jays signed free agent Lourdes Gurriel. January 23, 2016 Cuba activated OF Lourdes Gourriel. January 22, 2016 OF Lourdes Gourriel assigned to Cuba.